TORONTO — LeBron James insists he doesn’t dwell too much on previous seasons. But for the Toronto Raptors, their past failures are what define them. The Cleveland Cavaliers ousted the club in two consecutive post-seasons, including a four-game sweep in last year’s Eastern Conference semifinal. The Raptors’ disappointing performance prompted a revamped playing style that was meant to ensure that history wouldn’t repeat itself. To put it short, the team was built for this very moment — the chance to end King James and the Cavaliers’ reign over the East. On Tuesday evening at the Air Canada Centre, it sure felt it was headed that way. However, some squandered opportunities down the stretch, including a series of point-blank misses at the rim, ultimately sealed the Raptors’ fate as they fell 113-112 in overtime in Game 1 of their second-round playoff series. “A lot of things we did to ourselves. Some uncharacteristic things that we missed, some shots we missed, I thought was the difference in the game. I think we’re a better team, we just didn’t make the shots down the stretch. I know it sounds simplistic, but we had our open looks, had our opportunities that we didn’t cash in on,” said Raptors head coach Dwane Casey. The Raptors set the tone early jumping out to a 33-19 advantage after the first quarter and pushed the pace against the Cavaliers, hoping to make the most of a squad just coming off a seven-game battle against the Indiana Pacers. But the Raptors lost control of the tempo, turning the ball over nine times in the first half leading to 15 Cavaliers points off turnovers and cutting the Toronto lead to just three at halftime. “I thought at the start of the game, they had more pop than we had — just not as fast as we wanted it to be,” said Cavaliers head coach Tyronn Lue. Lue was quick to credit his team’s defence in helping Cleveland turn the tide in the second half. They limited the Raptors to 45 points in the third and fourth quarter combined and DeRozan and Lowry to just 15 points in the same period. The Cavaliers went with a bigger lineup on defence, using Brampton, Ont., native Tristan Thompson at the centre position to guard the Raptors’ Jonas Valanciunas. The Raptors made it a point to establish their big man early in the third quarter — continually feeding the ball to the Lithuanian and taking advantage of a sub-par defender in Kevin Love, who was tied for a game-worst minus-seven rating on the evening. 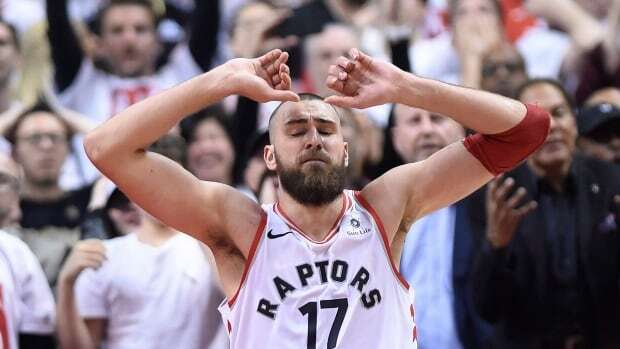 While Valanciunas would go on and post a franchise-record 16th career playoff double-double (21 points and 21 rebounds), Lue applauded the Canadian’s physicality and effort on the glass against the Raptors’ big man. Thompson followed up an impressive Game 7 performance against the Pacers with 14 points and 12 rebounds against the Raptors in the series opener and his impact wasn’t lost on his teammates. “Double T [Thompson] picked up right where we left off from Game 7, just being a monster that we’ve kind of grown accustomed to the last few years — on the glass, making his free throws and getting us extra possessions,” James said. But perhaps a bigger concern was the Raptors’ offensive execution down the stretch. The whole season was spent trying to reverse the isolation style of basketball that had become their trademark over the past several seasons and on Tuesday night, signs of the old Raptors crept in. “I thought we got stagnant offensively, stopped moving … We are better than some of the situations we put ourselves in,” Casey said. While Casey had no definite explanation of what happened to his team in the clutch, what can’t be debated is that the Raptors squandered a golden opportunity. James missed open looks, floaters in the lane — shots he makes routinely — partly because of fatigue and because of the fine defensive play of rookie O.G. Anunoby. Anunoby made the Cavaliers’ star work — picking him up at half court on each possession and forcing James to catch the ball as far away from the basket as possible. The box score will say that James notched another triple-double (26 points, 13 assists, 11 rebounds) in his legendary career, but he was far from his best. “I don’t think we played our best game and I think they know that as well. Shooting 41 per cent from the field, we usually do a better job,” Lue said.